A well-planned deck should be an extension of your home's living space and should blend with the look of the home. 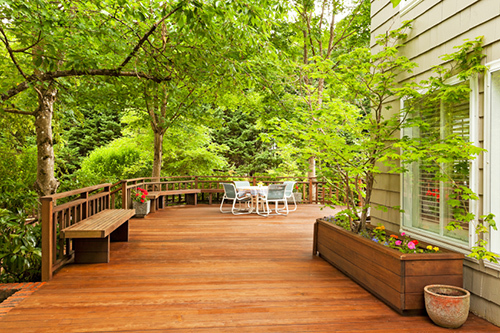 A deck can also create a haven from a busy thoroughfare. Decks with privacy screens can dampen noise and shield you from prying eyes. A deck should also draw the eye to the most ideal vantage point. Decking material options are usually decided by the homeowner's preferences, the style of home, and expected deck usage. For many Cape Cod homeowners, wood decking is an ideal choice. Wood decks offer the natural beauty of real wood, with its distinctive wood grain and earth colors. Custom wood decks are strong & durable, and meet the challenges of our four-season Massachusetts climate. The natural insulating properties of wood decking help to lessen the absorption of heat in the summer, while the natural strength of wood stands up to harsh winter conditions. Wood decks should be properly maintained, with staining and sealing of the deck every 3-5 years. Proper deck maintenance will ensure that your natural wood deck will look beautiful for years to come. We build high quality, low cost composite decks and vinyl decks throughout our Cape Cod service area. Composite decking and vinyl decking is strong & durable, requires less maintenance than wood decking, and is available in numerous textures, colors, and shades.